HomeWood Designer ForumPolyboardpolyboard dfx export. To set a groove to be machined as a pocket, go to the Biesse post processor settings and in the Groove section set the Mode to Milling, set the Kerf to the diameter of the router bit you will be using, the tool number can be set in the Tools section under Groove. 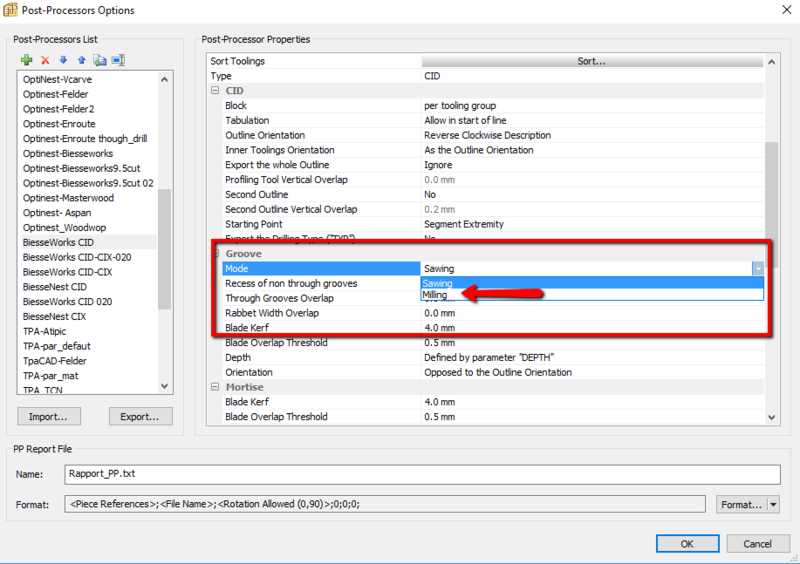 How do you change the Grooving to intertooling or how do you set it up to start in the center of a segment in polyboard or when you post a dxf files? Hi there, our records show you are a free subscriber. Please sign up for Premium Support so we can provide you with advice in this matter. 1. When import panel to optinest the reference name is numbering, How to change to name panel such back / side / door? 2. When I made shaker door 20mm panel with 60mm frame / 4mm inner depth, In Optinest drill inner through to panel.